I’m not really sure what to make of Ballers. It presents as a takeaway joint, with lots of red, white and blue on the menu, and tables that don’t invite you to linger. American colours, American-style menu. Meatballs is the name of the game. One of those menus where you combine ingredients from a series of lists. In this case choose your meatballs, your sauce, and your side. Then there’s a column called balls and buns, full of slider and sub options. it’s all very American in an ironic hipster kind of way. And there are lots of balls jokes. Especially in the loo. 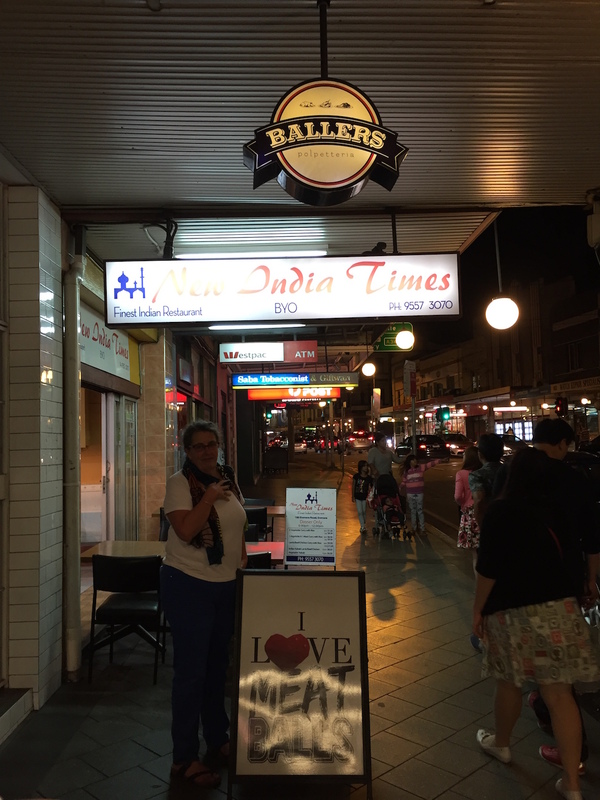 But the food is good and fundamentally Italian – apart from the slider business. We arrived at Ballers after a long walk from the Belvoir Theatre, where he had just been to see The Great Fire, which was a great disappointment. Supposedly, a great new Australian play, it was yet another exploration of middle-class angst. Lots of talking and very little drama – the worst kind of theatre. So by the time we got to Ballers we were both thirsty and hungry. We had a quick look down the road to see what was next if we decided to give Ballers a miss. Another Indian joint. This one also empty. We looked back at the menu again. Maybe it will be okay. 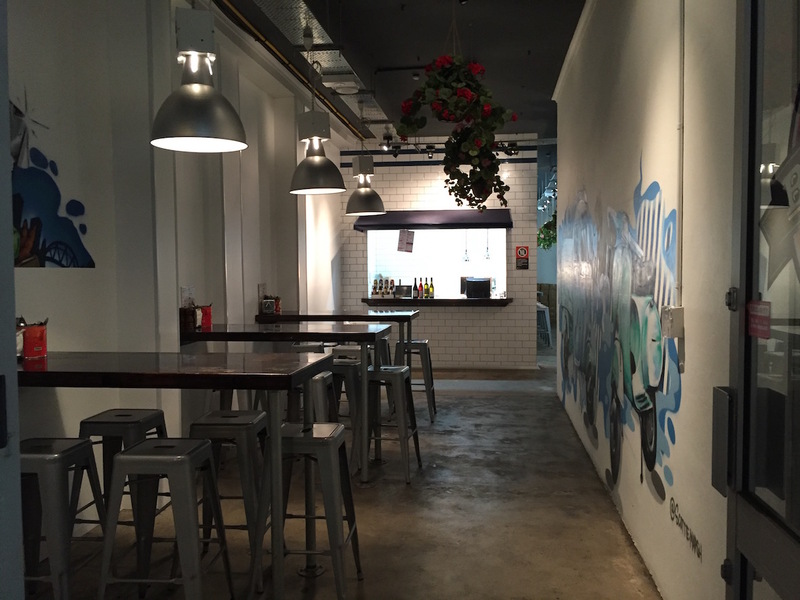 There is something appealing about the idea of a meatball eatery. It even has a special Italian name, a polpetteria. I was keen but Stop took a bit of persuading. In the end, despite the woman’s persistent blather we decided to give it a try. A decision that paid off. The woman turned out to be the owner’s mother, called in to help out because he was short-staffed. She was very keen. Very. At least knowing why made it easier to accept her enthusiasm. Strop went first and made the fatal error of choosing a vegetarian option in a place that has meat, if not in their name, in their reason for being. Meatballs. It’s all about the meat. Anyway, Strop has been a long-time ignorer of conventions, so she chose vegetarian meatballs, spicy tomato sauce and mash. I went the traditional route of spicy pork meatballs, tomato sauce and spaghetti. We also got a side of green veggies, a real Italian Peroni and a tumbler of rosé. The food came quickly. It seemed as if we had only just settled down at the cable-drum tables on the street, when two steaming, enamelled bowls of meatballs were placed in front of us. My spicy pork meatballs were delicious with just the right amount of chilli, a rich tomato sauce and perfect spaghetti. Strop’s vegetarian aberration was okay, as good as might be expected, but the spicy tomato sauce was a bit too hot for comfort. It wasn’t just a bit spicy, it was very hot. The mash was excellent though, rich and creamy and smooth. The green veges were excellent, perfectly cooked, beans, kale, and broccoli, with a light, lemony dressing. While we were there one other couple came in and sat inside and a couple of delivery orders went out, but overall it looked like a very slow night. I couldn’t help thinking that they might do better if they dropped the American/ironic-hipster imagery, and switched to Italian red checked tablecloths. There is a market for it, the Italian Bowl on King Street has been proving that for years. 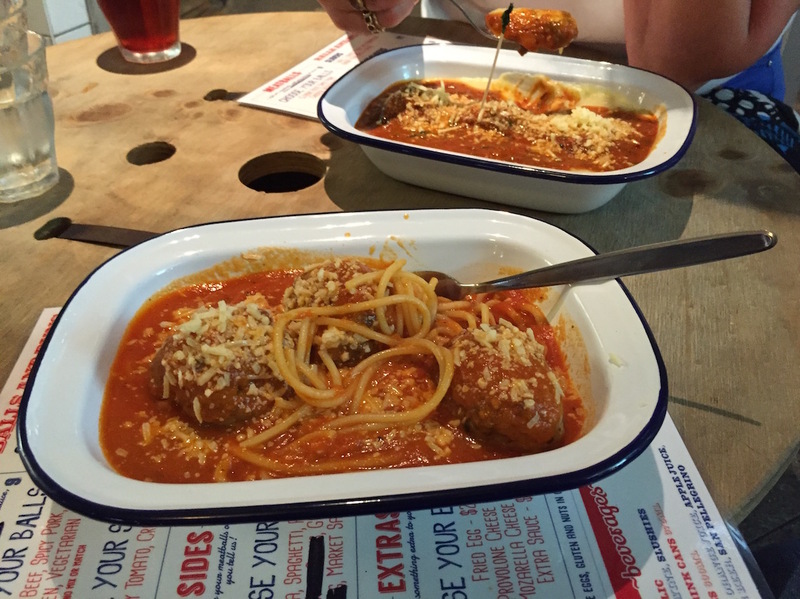 What’s not to love about delicious meatballs? The pedestrian traffic on Enmore Road lived up to its eclectic tradition. Tonight there was a lot of brightly coloured hair on the young women, and a lot of black-clad young men carrying pieces of drum kit back and forth. Something for everyone. On the way home we stopped at Gelato Blue, where I had the best passionfruit gelato I have ever had. Excellent work. So go to Ballers. Ignore the imagery, go for the food, it’s great.